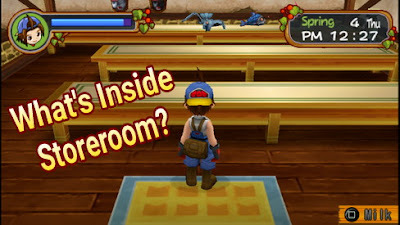 How to Complete Rare Items in The Storeroom Harvest Moon: The Hero of Leaf Valley is the most frequently asked question by Harvest Moon's Players besides How to complete the event. Unfortunately, in Google search, there are no single blogs that discuss it, even on websites and forums rarely anyone can provide the complete guide. Because of that, in this article, Droid Harvest will try to explain what we know to get them. Storeroom or you can call it the Storage room is basically a room for storing trophies or awards. The building is next to your house. Every time you get the rare items for the first time, Your character will say, "This looks rare, I'd better put it in the storeroom for later use". So, the rare items you get will be automatically saved as a collection in the Storeroom. If you get it again, you can sell it or give it to the villagers. Okay, before going into more detail explanations, keep in your mind that this rare item is mostly obtained from mining and fishing. It's base on your luck and it needs a lot of effort to get them. And the other rare items can be obtained from completing missions, for example, Mecha Event and Horse Champion. Here is the list of rare items that placed in the Storeroom. The order is from left to right. Fossil Ammonite, obtained from mining in the rooms 6 to 10. Trilobite Fossil, obtained from mining in the rooms 6 to 10. Plant Fossil, obtained from mining in the rooms 6 to 10. Ancient Fossil, obtained from mining in the rooms 6 to 10. The unknown object, obtained from mining in any rooms. Trophy, you'll get it when you win horse race type short, long, and Steeplechase. Sunken Treasure, obtained from deep-sea fishing on the Crystal Bay Beach or Underground Lake. Pirate Treasure, obtained from deep-sea fishing on Crystal Bay Beach. Treasure Chest, obtained from deep-sea fishing on Crystal Bay Beach and Underground Lake. Mysterious Clay Doll, obtained from mining in any rooms. Unusual Pot, obtained from mining in any rooms. Earthenware, obtained from mining in any rooms, also can be found from fishing on the Underground Lake. Broken Mecha Crow, you will get it after defeated Mecha Crow. Broken Mecha Fish, you will get it after defeated Mecha Fish/ finish the Mecha event. Coral, can be found either by fishing or laying around on the Crystal Bay Beach. Diamond, obtained from mining in room 10 or successfully get all mineable items. The three items above related to the Mecha Horse and Bob's Horse race event. So, if you want to get those rare items, you have to finish the mecha and horse champion event path if possible. But if you do this at the same times, you will not get one of the items above. Particularly for the brown horse's head, you must purely follow the mecha event path (Shoot for the Star) and you should not follow Bob's event. If you follow Bob's event path, you will not get the brown horse's head, but you still get the silver and black color. The question is how to get three of them? how to outsmart it? After you saved the village by the end of year 2, there will be two options. The first option is Go to part 2 and the second is back to the start but use existing data. You must choose the second option. Then just finish the mecha event path or horse champion only. Choose one that you have not yet completed. If you do this, you should have all those horse's head with different colors.